The battle of Maiwand took place in the Second Afghan War. Fear of Russian designs in Afghanistan led Britain to interfere in its affairs. Britain had recognised one of the claimants to the throne after the previous ruler had fled to the Russians and after occupying Kabul and Kandahar the British withdrew. Subsequently the British envoy was murdered and the job had to be done over again. Kabul the capital was held but a small force from Kandahar in the South was defeated by another claimant, Ayoub Khan at Maiwand, which is presumably when Hector Maclaine lost his life. Thereupon General Roberts executed the famous march from Kabul to Kandahar 313 miles over the worst country in Asia in 23 days and destroyed Ayub Khan’s large army with the loss of 40 men. This particular part of Britain’s involvement in Afghanistan was seen in Britain as a great triumph for the British Army. 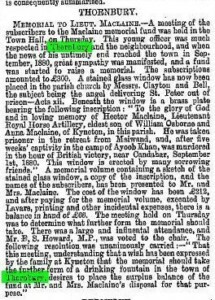 There was a newspaper report of 31st December 1881 that described the events and the fund that was formed to place a memorial window in the church. 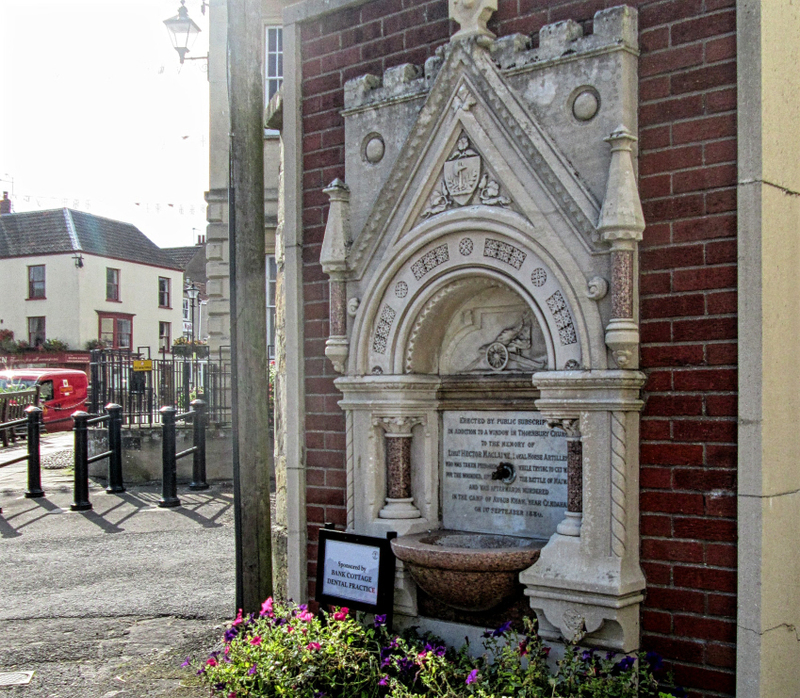 The fund was so well subscribed that the surplus money was used to provide the fountain. See the newspaper report for further information. 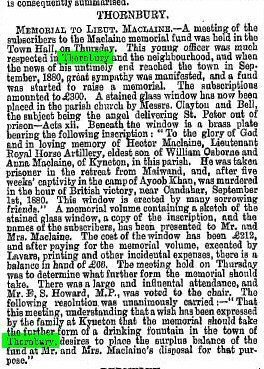 William Osborne Maclaine, who was mayor of Thornbury at least three times in 1852, 1865 and 1876, had already played a role in bringing water to Thornbury. Written inside the parish records is a note that “91 feet well was dug in Bullseye Lane by William Osborne Maclaine in November 1859”. George Ford who has spent some time researching local history (especially pubs) has told us that this well became contaminated after the market was opened up close to Bullseye Lane and it could no longer be used as a water source. 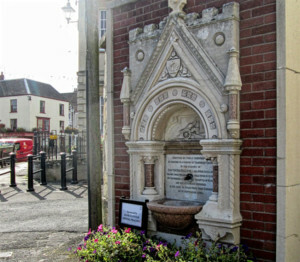 The photograph at the top of the page shows the Maclaine Fountain in its original position, in the High Street between the Methodist Church and the Register Office. When the fire station was built the fountain was placed more or less in its original position, but now it stood between the doors of the fire station. See the photograph on the left, taken in 1946. Soon however bigger fire engines were used and the doors had to be made wider. In December 1956 the Planning Officer received the proposals to move the memorial from the fire station to its present site on the top of Castle Street near Latteridge Lane (the lane that runs alongside the bank).